Spaghetti squash can be found in store early fall to spring. 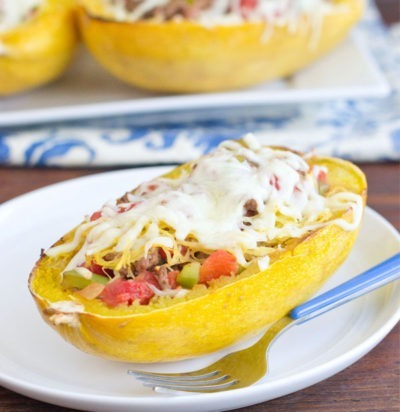 Spaghetti squash is rich in Vitamin A, Vitamin C, potassium and calcium. Choose a firm spaghetti squash that’s free of soft spots and feels heavy for its size. The stem should be firm, dry and rounded. Avoid spaghetti squashes with cracks, soft spots or missing stems. 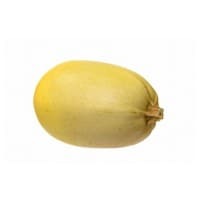 Store spaghetti squash in a cool, dry place for up to 1 month. Use a large, sharp knife to cut the spaghetti squash in half length-wise. Use a spoon to remove the seeds. Spaghetti squash can be baked, boiled or microwaved. Once cooked, use a fork to rake out the stringy flesh. Spaghetti squash originated in Mexico/Central America.